"You want to go where??? 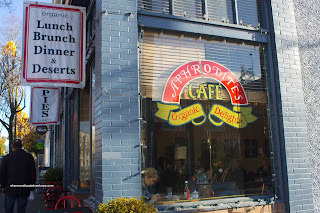 ", exclaimed Rich Guy as I was in the middle of suggesting Aphrodite's for some brunch. A slight hesitation in his voice was followed by curiousity. Luckily he was getting his car serviced at MCL (of course it was) and he was somewhat in the area. Hence, the excuse of "being too far" could not be used. Naturally, when he found out it was a quaint pie shop as well, he was even more hesitant. Not manly enough for him I suppose? Oh c'mon, we're comfortable with our sexuality right? Besides, what era are we living in anyways? What's the problem with 2 dudes brunching and sharing a slice of pie? 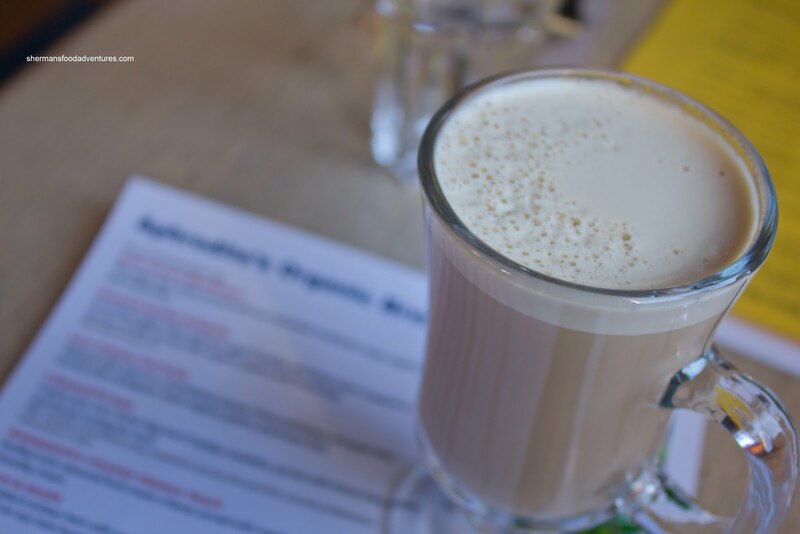 Arriving first, I snagged a window seat and proceeded to order a Chai Latte to start. Well, I'm not about to go into detail about it because I'm not a Chai connoisseur. What I can say is that it was not too sweet and very smooth. A good start to our meal. Rich Guy arrived shortly after and ordered the same drink. We had a bit of difficulty choosing from the menu since everything sounded quite good. Finally, I had to resort to "asking-the-waitress" trick. Her recommendation? The Sausage Frittata which incidentally, was predominantly loaded with veggies. 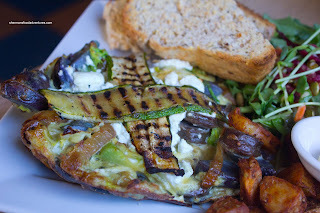 The thing was packed with caramelized onions, grilled zucchini, goat cheese, sausage and beets. Although it was not aggressively seasoned, the frittata had enough inherent flavours emanating from the quality ingredients. The natural sweetness of the onions went really well with the savoury sausage. 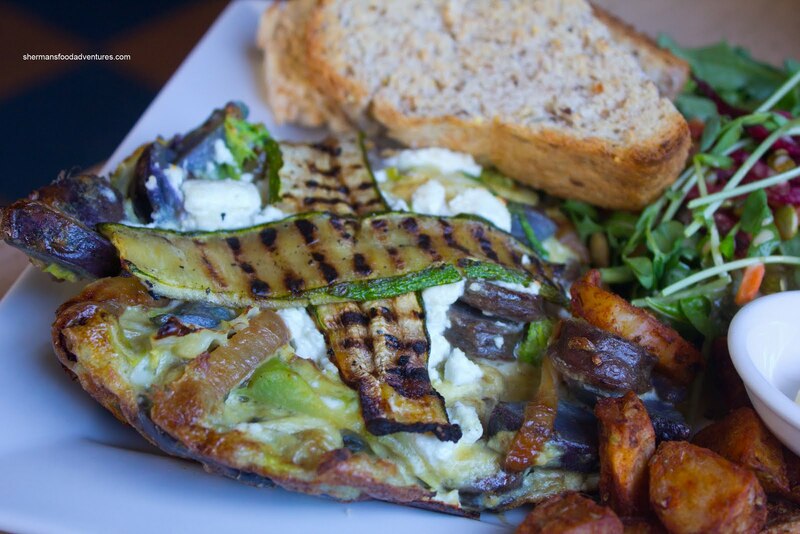 Interestingly, the frittata played second fiddle to the outstanding toast served on the side. It was so airy and crisp. The house-made peanut butter only further enhanced the experience. Rich Guy went for his usual in the Benedict. However, this one was more interesting since it was an Albacore Tuna Benedict. Due to the mild flavour of the tuna (which was a nice medium-rare), this in turn was a subtle offering. 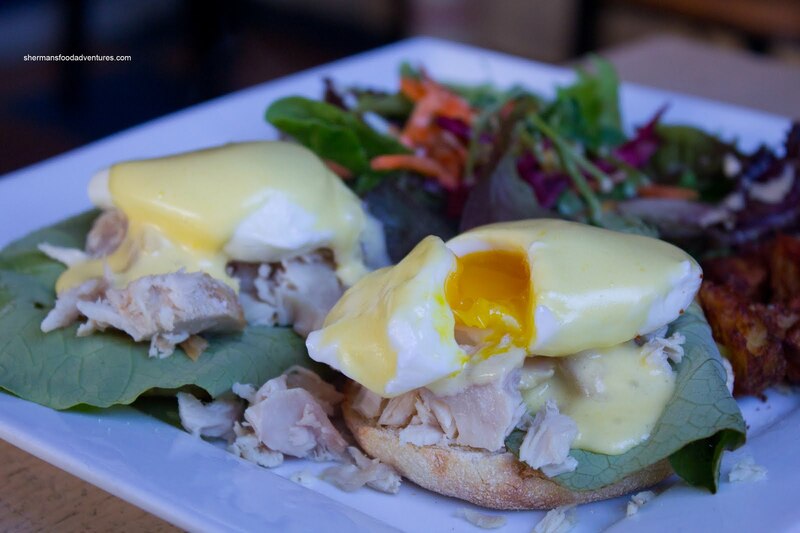 Even the Hollandaise was on the lighter side, except there was a pleasant lemon hit. The free-range eggs were poached perfectly medium as Rich Guy requested. 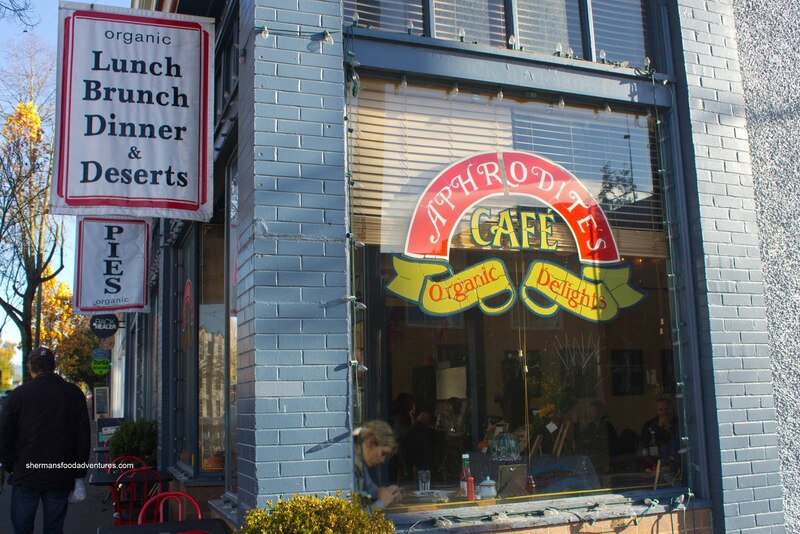 Despite being breakfast hours, we couldn't leave Aphrodite's Organic Cafe & Pie Shop without a slice of their specialty... Mijune would be proud... 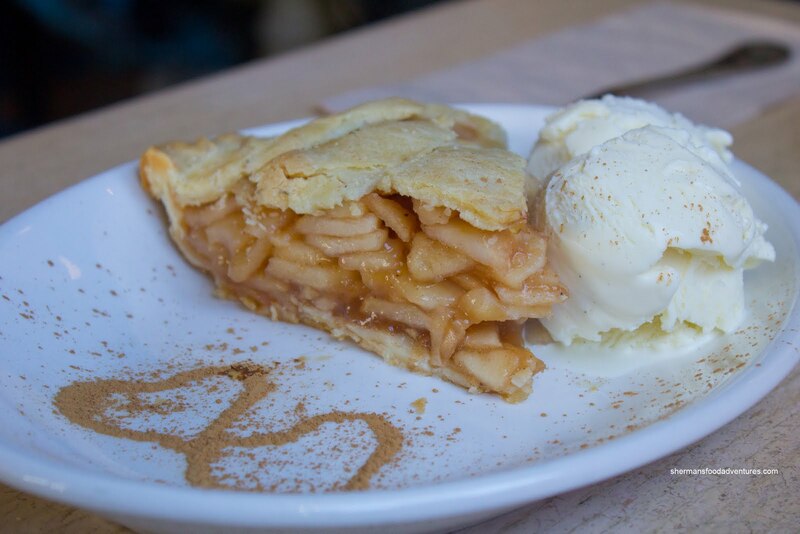 So we ended up sharing a slice of Apple Pie a la mode. Interesting how they did a nice cinnamon double-heart thingy on the plate... As for the pie, the apple filling was neatly prepared with the perfect consistency. Hence, the crust was flaky and not soggy anywhere. I would've personally liked to see more zing, otherwise, this was a very solid slice of pie. In fact, our experience here was pretty good. I wouldn't go as far as saying "we can't wait to go back", but I would go back nonetheless. I've tried their pie, but I still think Savary Island makes the best apple pie, hands down. Their crust is just amazing and I swear they put some kind of magic ingredient in it to make it so light and flaky.